Congratulations, Niantic. You’ve done something that I didn’t think would ever be possible! You’ve made a game, for Smartphones, that I actually ENJOY PLAYING! I didn’t care for Angry Birds, Flappy Bird, or Candy Crush. Mobile phone games to me were shallow. 5 minutes of fun, and a throw-away experience. However, when I heard there was a new Pokemon game coming out, and Game Freak’s name was on the title screen, I had to give it a whirl. 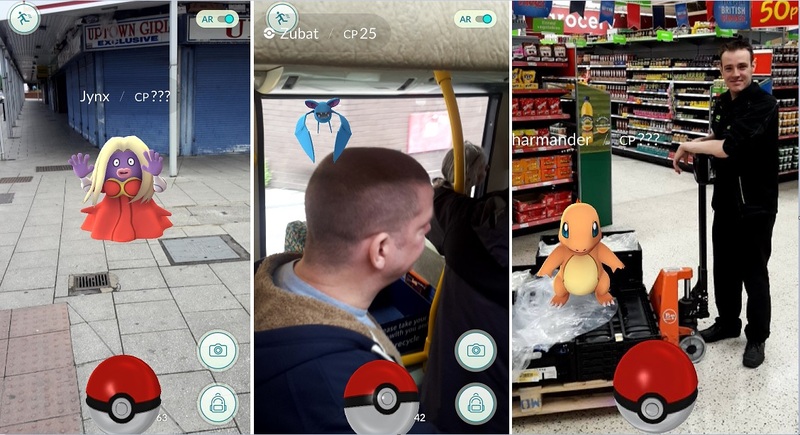 This is what Pokemon Go looks like. Yes, this is what all the fuss is about. How do you move your character? By moving your feet! The only way to get anywhere in the game is to travel there yourself. The map your character is on is an EXACT copy of the streets, roads and paths we use every day. On the bottom right corner you’ll see three Pokemon. These are the ones in my immediate vicinity, and if i look around this area, chances are one will pop up and I’ll be able to tap on it and have a bash at capturing it. Once you’ve tapped it, your phone’s camera comes in to play! 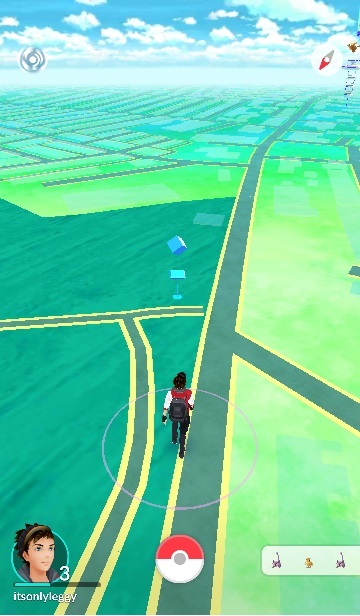 Now you have to swipe the pokeball at the bottom towards the pokemon. The swipe needs to be just right, so the ball hits the Pokemon. You have limited amounts of pokeballs, so aim carefully! A successful toss will zap the pokemon into the ball, and if you’re lucky, he won’t break free! And all the time, you’ll be hunting for new ones. The game uses the original 151 Pokemon, so Charmander, Geodude, Pikachu are all in…. the ones that most people remember! Here we see one of the nearby Pokemon “greyed out”. This means I haven’t caught him yet. Walking round and round this area in circles staring at your phone will make you look stupid to the general public, but hey-ho…. gotta catch ’em all! It’s not just Pokemon you come across in the world either. See these blue squares on my first picture? This is a Pokestop. These are landmarks on the real-world map and tapping them brings up a nice little picture. Swipe the picture for bonus items, and extra Pokeballs! There are also Pokemon Gyms where you can fight other trainers, although I’ve not tried these yet! It gets addictive, I won’t lie. Levelling up your character, catching all the different Pokemon, levelling THEM up… you can even evolve them if you have enough candy! 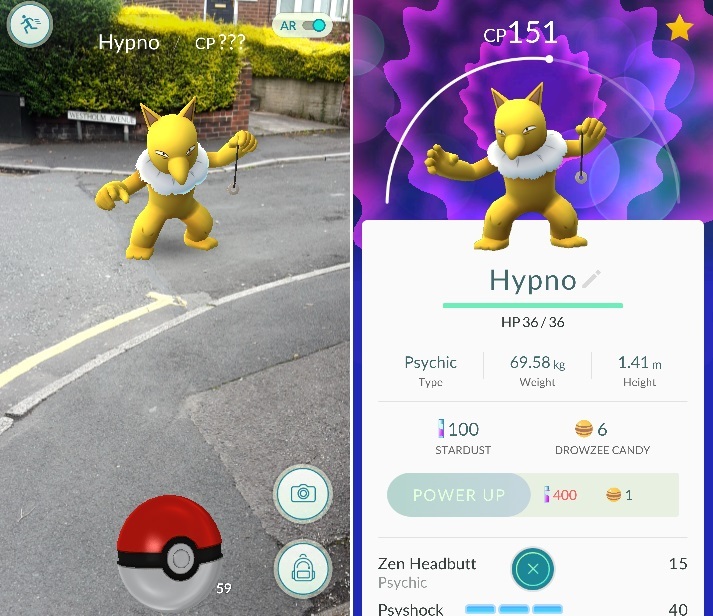 Hypno put up a great fight, It took a good 5 minutes and around 15 Pokeballs to bring him in! I love this game. It’s so satisfying to find a rare Pokemon and after a tense struggle, finally capturing it. Several of my non-gamer friends have become Pokemon Trainers overnight, and we’ll swap stories and the odd funny screenshot. Funny screenshots? Yeah. 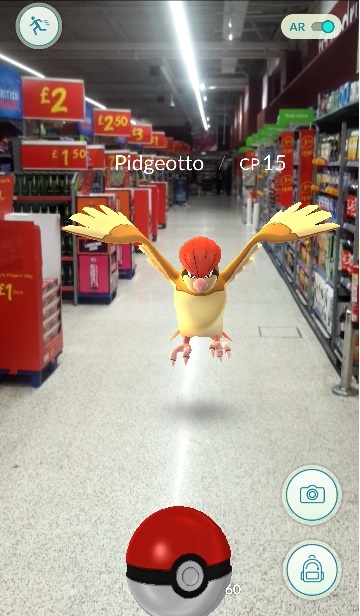 Because the game uses your camera, Pokemon can now invade everday situations. I smell a competition! Calling all Pokemon Go! Players: I’d like you to submit your funny Pokemon moments. Simply take a screenshot on your phone and submit it to the Load/Error Page on Facebook. (Or you could message me, it’s up to you.) All submissions will be put in a future post, and the best one will win a Pokemon Prize. Closing date for submissions is exactly one month from today, so that’ll be the 12th of August. Good luck! The game has taken the Internet by storm. 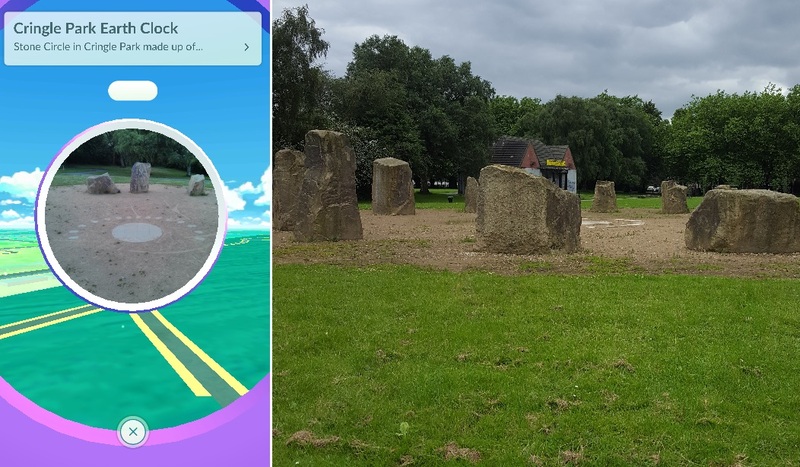 There are reports of people falling into rivers trying to catch Pokemon, phones being stolen from wannabe Pokemon masters, and even a conspiracy theory around the data your phone collects as you’re out on your very own adventure. Good or bad headlines, this one single game has put Pokemon back on the map, just in time for Nintendo’s brand new NX Console! Smart. Oh, and it’ll get your kids off the sofa for a change, too! Posted on July 12, 2016 July 16, 2016 by itsonlyleggyPosted in ModernTagged 1stplay, Competition, Pokemon. This game looks great! Was never a big Pokemon fan,but the concept involved with this app looks awesome! So has Nintendo innovated again? Possibly,but this much I’m sure of: I Gotta get rid of this windows phone and upgrade to get ready to catch em all! There is an iPhone workaround for those who want to play it in the UK. You first need a US iTunes account to sign into – search and download the app. Then just sign out of the US account and sign back in using your normal UK iTunes account. Once the UK one becomes available delete the app and redone load the UK version. A bit of a pain but for those who can’t wait there’s a solution! Thanks for the comments, I’m sure you’ve helped some people out there! 🙂 are you playing this Mr O? And if so what do you think?